Summons are a somewhat staple in the Kingdom Hearts series, but unfortunately have been lacking in the last few releases. Thankfully it seems that Kingdom Hearts 3 will bring back summons! Speaking with Gameinformer, Nomura couldn't exactly reveal much about summons, however he did hint that they've made them "more pretty". There has been more than just a visual boost, he stresses, adding that they've expanded on "how we're expressing it". Could this include a new form of summons - Attraction Flow? Nomura also dives into discussing Keyblade Transformations. He first reveals that each Keyblade will have it's own form that it can transform into, and each Keyblade is different. Yes, the Kingdom Key will have a transformation! 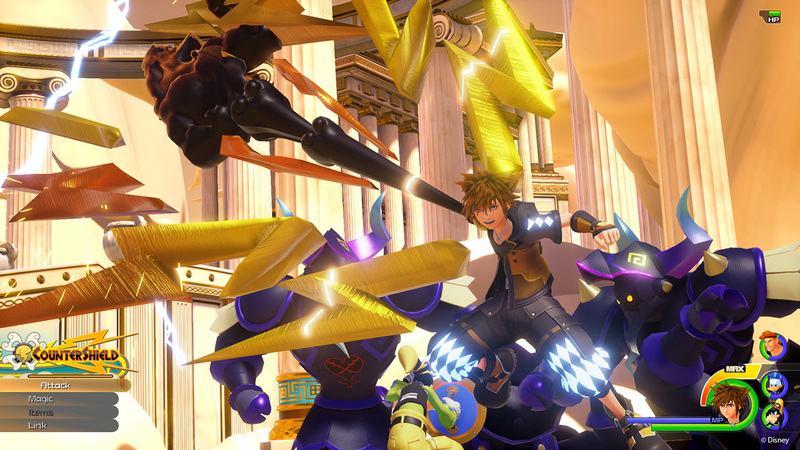 As we saw in the D23 trailer, the Toy Story Keyblade can transform into Hyper Hammer and Drill Punch, while the unknown Keyblade that resembles Kingdom Hearts Union X's Starlight can transform into Double Arrowguns and a Magic Launcher. You activate each transformation by successfully connecting your combos, so it isn't always a guarentee that you will be going to the next transformation! Unfortunately Nomura couldn't confirm much else on Keyblade transformations as they are still finalising the specifications. Finally, Nomura touched upon Athletic Flow, the name of which is subject to change in the English release of the game as localisation hasn't been finalised just yet. It is based upon Flow Motion, which was introduced in Kingdom Hearts Dream Drop Distance. As you can see in various trailers, Sora can climb up walls or jump over gaps in ways he previously was unable to. 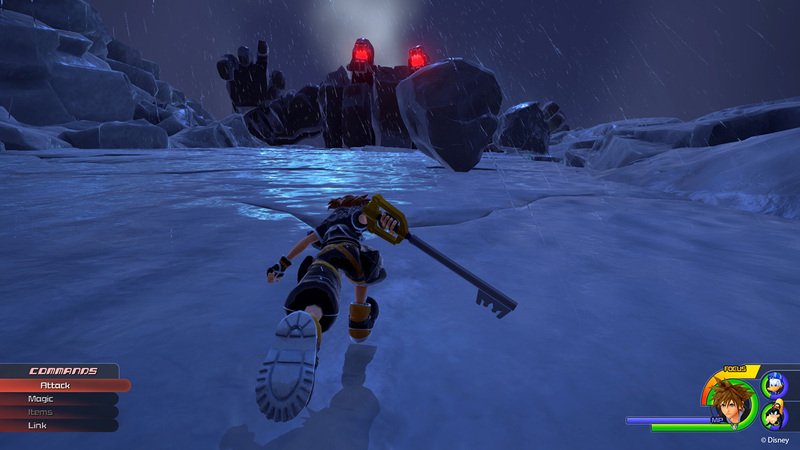 The ability to do so is Athletic Flow and can be expected in each world you visit in Kingdom Hearts 3. There were two interviews with Nomura at d23. One with ign and one with game informer. Each are revealing their interviews one question at a time because they never get to interview him. I stand corrected. Thanks yo. Equal opportunity is always best any who. I wasn't expecting the Kingdom Key to get a transformation due to being the base form. Apparently dual shockers got an interview too, but there's is releasing this week. Yes, currently catching up. IGN, Gamespot, Dual Shockers, Gameinformer etc. We should be getting the Famitsu scans this coming Wednesday as well. So glad to hear that summons are still in the game. I imagine Bullseye may be a summon? I am fully convinced Marvel or Star Wars will be a summon, like Yoda. Marvel or Star Wars will be used like FF is in the games. I will be shocked if the kk transformation isn't dual swords. Think about it what way to continue the trend KH2 established of having dual wield almost from the get go. And this way when Ven gets his key back Sora can still be dual wielding no problem. I think they might leave dual wielding to other Keyblades? Like, I can see Oathkeeper and Oblivion. I mean technically we have (kinda) if you count the No Heart boss in BBS. Edit: Actually wait doesn't he have a whip transformation hm. YX also showed off quite some transformations during his DDD boss battle if I recall correctly. I have a feeling that Attraction Flow are the new summons... which is a shame because now we can't have character's like Bolt, Genie and Eve in the game as a form of combat. The idea of implementing Marvel and Star Wars characters as Summon could be a neat idea to gauge fan reaction towards implementing a Marvel/SW worlds on KINGDOM HEARTS. But with how well Unreal Engine 4 and the Kingdom Shader manage to mesh well KH with Disney, Marvel and SW in KH wouldn't look so weird and out of place. Are transformations going to be a Sora specific thing? Because it hasn't been mentioned if anyone other than him can... granted, we legitimately know very little about the game anyway. Transformations have been a thing since BBS. Terra, Aqua, and Ven can all transform their keyblades. As can Xehanort, in the No Heart Armor battle. I think he does a few, he turns his Keyblade into wings, like wrist blades, and then just into a weird darkness shield thing. I assume Chaser means he wants to see those and more added, especially since these new transformations are so cinematic and different ha. Technically Young was actually Master Xehanort in the DDD fight, so I guess he just has the skill. Sorry for being the Negative Nancy, but the Keyblade transformation was something that I found fascinating when Terra and No Heart did it, it felt so... imposing, and terrifying. Now Sora uses it and it looks like the Bros Attacks in Mario&Luigi. Just from a """lore""" point of view, I'm a bit displeased. Not everything needs to be backed by lore, but yeah, I get your point. As the series how progressed, the Keyblade has lost that "mysteriously magical and intriguing" charm it had. I think Sora being able to do something we've seen in the series, but hasn't been made a big deal out of is pretty cool. Also, the transformations are very fitting to Sora's personality, just like with Terra/Lingering Will. Of course when they give you full control over something it'll lose its mystery.